In a Netflix-streaming world, it's a challenge to keep a vintage movie house going. But Bill Shafer and Ben Wells of Middlebury's Marquis Theatre have taken a novel tack. They closed their digitally equipped triplex — built in 1939 as a vaudeville house — on August 25. It will reopen on or around October 29 with major renovations that include the addition of a southwestern restaurant. Shafer enlisted new co-owner Wells, a restaurant-business veteran and Middlebury College rugby coach, to bring his dinner-and-a-show plans to fruition. "I managed a southwestern restaurant in Boulder, so I've got a pretty good background in that cuisine and style," Wells says. "That was [Shafer's] vision all along. It was fortuitous that I had a background in it." Middlebury hasn't had a Mexican restaurant since Amigos Cantina closed in 2009; its space is now occupied by Sabai Sabai Thai Cuisine. "There's a great demand for that kind of simple, fresh food," Wells suggests. Shafer and Wells gutted their downstairs theater and converted it into a kitchen and a seating area to include regular and high-top tables and booths. A 12-foot screen will project sports, and Wells envisions showing black-and-white classics during lunch, as well. The restaurant will be open for lunch and dinner daily. Diners can stop at the café area for lunch or bring their food into one of the two theaters upstairs. In the largest of these, the first four rows have been cleared to make room for couches and beanbags — a comfy spot for parents to bring their kids for free lunchtime cartoons. At night, adult moviegoers will be able to relax over beer, cider or wine procured downstairs. Wells says that he and chef Dusty Simmons will strive to keep all menu items under $10. Almost all the dishes are designed as finger food, easier to eat in a dark theater. Four different tacos include smoked chicken; smoked brisket; house-braised carnitas; and quinoa with roasted corn, pine nuts and tomatillo salsa. Also on the menu are burritos, enchiladas and a nacho plate topped with house guacamole. 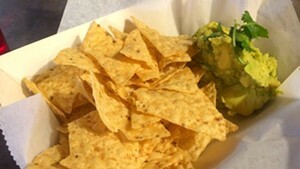 "Something really important to us is that we have really, really good guacamole that's hand-mashed fresh," Wells says. "We'll be paying a lot for great avocados." Of course, moviegoers will still find regular concessions such as popcorn and coffee. But some snackers may prefer to grab sliced jicama, roasted nuts or a brownie served with warm fudge sauce, all available at the restaurant. With the new culinary focus comes new entertainment plans. Though the Marquis will continue to show first-run movies, Wells says to expect live shows and uncommon film events, such as ski flicks and perhaps a Bollywood night. Might we recommend some southwestern cinema to pair with the tacos? The original print version of this article was headlined "La Cena y una Pelicula"